Visit our Open Show Calendar page for Open Shows where separate classes are scheduled for Newfoundlands. Download Schedules and Entry forms or enter online (if available). Show Secretaries and judges, please make sure we have your shows and classes listed! A highly qualified and experienced animal behaviourist is available to provide free advice for members by telephone. Details of the scheme are on the Behaviour Helpline page. The latest revisions to the Draught Test regulations, effective from mid 2011 have been agreed by the Southern Newfoundland Clubs and the Newfoundland Club. They can be downloaded here. The latest revisions to the Water Test regulations effective from 01 June 2011 have been agreed by all three UK Newfoundland clubs and can be downloaded here. An important new initiative promoting health in Newfoundlands in the form of a shared database of health check results is now online. We are encouraging Newfoundland breeders and owners to submit their dog's results - FOR FREE. Please contact SNC Welfare if you can offer a new "forever" home to a newfie. Foster homes for the assessment of dogs in the care of SNC Welfare are urgently needed. Members are reminded to let our Puppy Liaison Officer know about new litters. Prospective newfie owners can contact Diana by email or phone. The Newfoundland's working capabilities are well demonstrated by it's abilities as a draught dog. Developed for their strength, stamina, steady temperament and willingness to serve their owners, draught work is a super way to exercise and develop their instincts. 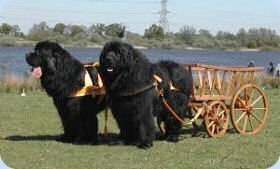 Newfoundlands like to work, they are happy and well-adjusted when they are allowed to perform the functions they were bred for. 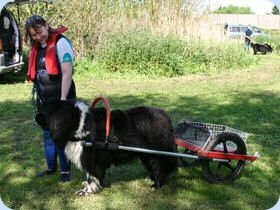 In learning the working disciplines, a Newfoundland is encouraged to be obedient and controlled ... highly desirable qualities in a giant breed. 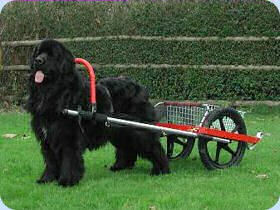 The Southern Newfoundland Club is keen to promote the safe training and working of Newfoundlands across the UK. The emphasis is on having fun with your dog and enjoying developing the dogs natural instincts. We strongly recommend that you join one of the many Working Groups around the country as there you will receive the best advice and assistance in starting out to work with your Newfoundland. Call or email if you would like us to put you in touch with your nearest working group. Alternatively, a list of the UK Working Groups appears on our Links page. We organise events, usually held in conjunction with independent working groups, which feature draught work including Fun Days, Spectaculars and formal Tests. A list of forthcoming SNC events can be found on our Events page. The current Test Regulations effective from mid 2011 are used by the Southern Newfoundland Club and the Newfoundland Club. The full Regulations can be downloaded (as an Adobe PDF document) by clicking here. We recommend water containers are used as 1 litre of water = 1 kg in weight. Therefore a filled 5 litre water container = 5 kg weight, and so on. Copyright Notice: All images and documents on this site are the property of The Southern Newfoundland Club unless otherwise noted. All rights are reserved. No reproduction, storage in a retrieval system, or transmittal, in any form, or by any means, electronic, mechanical, photocopying, recording, or otherwise, of duplicate copies for loaning, renting, selling, allowed without prior written permission of the Southern Newfoundland Club. This web site is copyright © 2008-2019 The Southern Newfoundland Club (SNC). Disclaimer: Acceptance and use of the information contained on this web site constitutes an acknowledgement that the user hereby releases and indemnifies SNC and its officers, members and agents from any and all liability and damages sustained by the user as a result of any information obtained from this web site.